In my line of work I often have to remove crap software from computers. Most of the people don't know how it got there, primarily because they're not paying attention when they're updating something or adding something. Java updates are a good example. You always get a screen informing you that a toolbar is going to be installed, but it's not that obvious. You have to uncheck a box and click Next. Most people just keep clicking Next to get the process over with and software manufacturers have been taking advantage of this behavior for many years now. Here's a different example. I was trying to install CutePDF when I was presented with a screen that was going to change my browser search options. I unchecked the boxes and and clicked Next and got this screen. I clicked Ok and clicked Next again. 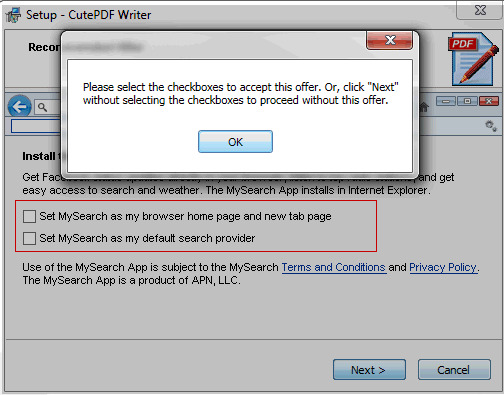 And I got the same message to select checkboxes or click Next without selecting the checkboxes. I clicked OK and clicked Next. And got the same damn screen a third time. By now most less-than-savvy users would select a checkbox and click Next just to get past this. But I persevered and this came up next. Again, most people would numbly click Accept thinking they're clicking Next and then wonder why they have some weather thing loaded up all the time. Of course, removing local admin privileges nips all this in the bud. I can't even count how many Conduit search I have uninstalled. 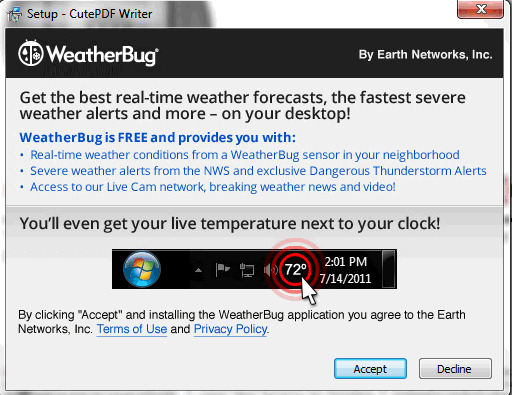 It's crazy how many times I have uninstalled it from the same users who installed the malware after I cleaned it out.